Previously Knockfune E Top in MV. Knockfune is the 723rd highest place in Ireland. Picture from simon3 : Slight track near the summit. Picture: Slight track near the summit. One way, not necessarily the best, of reaching this summit is to park at R82340 63991 A where there is space for a few cars. Walk into the forest following the tracks (marked reasonably accurately on the 1:50k at this point) until you get to 836641 B. Go east across the stream and reach the track. Follow the track towards the summit. There are two possible tops. One which probably is the higher is in the trees and can be reached by going to a foresters path cut through the trees starting at R84547 64474 C which is at the NE edge of the forest. The summit is about 70m SW of this point along the forester's track. The other candidate summit is at R8448 6470 D and has the advantage of being in the open with some sort of view. There is a new forest road running across the top of Knockfune. Coillte seems to be preparing for both harvesting and replanting. There is also a large aerial perhaps 300 meters from the very top. This was erected some years ago, probably to assess windspeeds for a windfarm that was never developed. It is hard to pinpoint the exact summit of Knockfune. A much better view is available just to the north outside the forest. 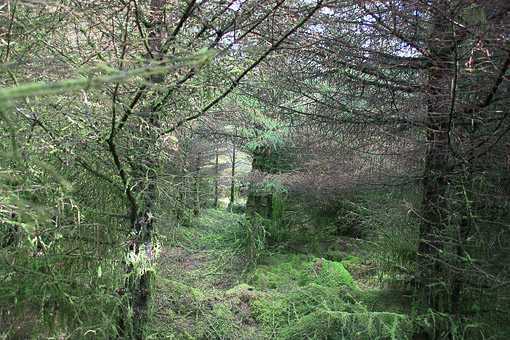 It is now easy to link up both Knockfune and nearby Knockane using the forest roads and the Slieve Felim Way.